Neon Signs Australia was founded over a decade ago and has since lit-up Brisbane and the surrounding areas. Michael and Duncan mastered the craft under Dean Blazek at the Northern Wisconsin Neon Workshop, and are now proud of their capability to create ANY sign to suit the needs/desires of Australian business owners. We take great joy in livening the streets with creative wayfinding and vibrant branding projects. Neon is a time-tested, reliable, and beautiful material/process, and we'd like to see your business light up with it! Every neon tube you have ever seen has been bent by a human hand. This is a process which takes time and skill to master, and frankly...we love it. 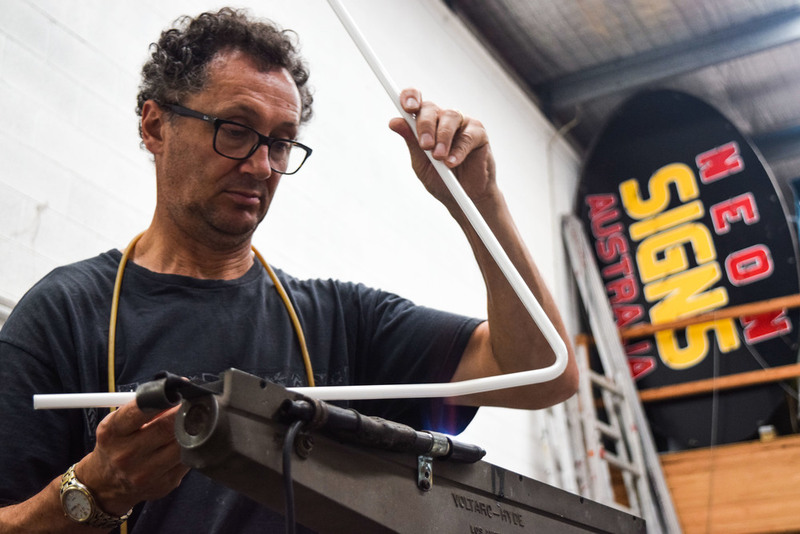 We put calculated care into every tube we bend and pump, because we know that when we drive home at the end of the day, we get to see your sign light up Brisbane and Australia. We acknowledge that every product has its costs on the environment, so we are very conscious about our use of materials in and out of the shop. We are proud of our concerted efforts to collect and recycle the Mercury from our (and other) neon signs to divert from landfill. Recycling glass has been common practice for us forever, and we continue to improve our practices to do our part.